April 2nd 2011. The day LCD Soundsystem died. James Murphy killed his band at the height of its fame, going out with a triumphant final concert at New York's Madison Square Garden. 'Shut Up And Play The Hits' chronicles the before, during and after of that fateful night. 'Shut Up And Play The Hits' directors Dylan Southern and Will Lovelace have previous in the music documentary business, having helmed the Blur documentary, 'No Distance Left To Run'. The film premiered in the UK at Sundance London 2012 to mostly positive reviews, although I was one of the few to find it rather disappointing. 'Shut Up And Play The Hits' footage of the preparations for the farewell concert, a sit-down interview between Murphy and journalist Chuck Klosterman, the concert itself and the post-concert come down. Some of this footage seems deliberately inane, a masochistic take on the lull felt by LCD Soundsystem fans following their disbanding. Casual observers may find the journalistic interludes of most interest as Klosterman quizzes Murphy on his curious decision-making. The bulk of LCD Soundsystem fans however will be watching to experience a taste of that final concert. And a taste is what 'Shut Up And Play The Hits' gives us, with only the rare song being given a full showing. Albeit in a beautifully shot form. 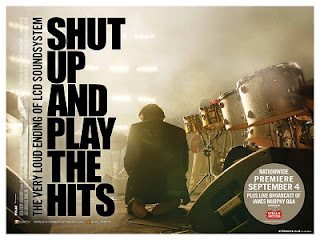 The film lacks depth, opting to skim the surface in its use of footage as well as lack of interviews with the live members of LCD Soundsystem. In terms of being a legacy piece, 'Shut Up And Play The Hits' is unfortunately something of a bum note. "The very loud ending of LCD Soundsystem", the marketing claims. If only. 'Shut Up And Play The Hits' is out now in selected UK cinemas, find more info at shutupandplaythehits.com.